Garmin has had a lot of success with its GPS watches in recent years. 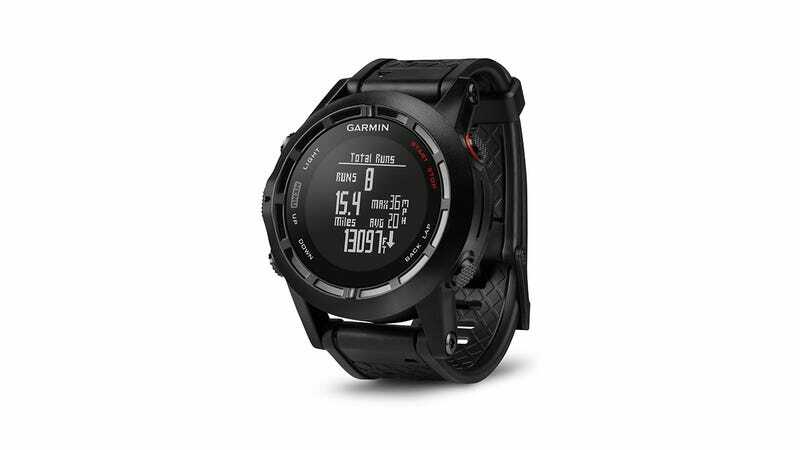 There's the Forerunner 910XT, which has been the king of triathlon watches for years now. There's the recent Forerunner 620 (and the 220) which added advanced analysis of running dynamics to the equation. And then, of course, there's the original Fenix, which was an incredibly versatile outdoor watch that focused on exploration. Wouldn't it be awesome if Garmin Voltronned the best features of all those watches together into one all-powerful training and outdoors watch? Yes, it would. Meet the Fenix 2. As far as we know, the outdoor/adventure capabilities are more or less the same as the original Fenix, which isn't a bad thing as the Fenix had an absurd amount of options. Highlights include an altimeter, barometer, and 3-axis compass, mapping and navigation, GPS breadcrumbs, up to 10,000 track points, up to 1,000 waypoints, TracBack (to keep from getting lost), sun/moon info, hunting/fishing calendars, the capability to load routes and adventures onto the device, geocaching, and the ability to display multiple time zones at once. One significant outdoor addition, though, is the Ski-Board mode (pictured above) and the XC Ski mode. In Ski-Board mode the Fenix 2 measures your three-dimensional speed and distance (i.e. horizontal distance and vertical drop). It will auto-pause the time and distance when you're standing still or going back up the ski lift. Each run will be stored as a lap, so you can see and compare data from each individual run. The watch also comes with a strap expander so it can be worn on the outside of your jacket. I am dying to try this feature out. Now let's see how it cannibalizes other popular watches. The original Fenix kind of dabbled in running and cycling. It worked okay, but it seemed more like an afterthought, and it certainly wasn't intuitive (I missed out on tracking my first mountain bike race because it seemed to be recording when it wasn't). Meanwhile, Garmin's Forerunner 910XT has been the hands-down best triathlon watch since it came out in the fall of 2011. So the Fenix 2 just stole its best features. In addition to acting like an honest to goodness multisport triathlon watch (one you could actually use on race day), it took the 910XT's awesome swim features. For indoor and outdoor swimming, the Fenix 2 can record your stroke count, interval distance, pace, and time. If you're swimming indoors, it can count pool lengths, automatically determine your stroke type, and even compute your SWOLF (that's swim-golf, where the fewer strokes per lap the better) score so you know how efficiently you're swimming. It's also borrowed from the Forerunner 620, arguably the most feature-rich running watch ever made. Not only can the Fenix 2 keep track of your running cadence (one of the most important but least tracked metrics), but when paired with Garmin HRM-Run heart rate monitor, it can give you even more detailed analysis of your form, including vertical oscillation and ground contact time. Essentially it coaches you to be a more efficient runner, which should decrease the risk of injury. It can also estimate your VO2 max, calculate your needed recovery time between workouts, and even predict your finishing time for race day. This in addition to detailed interval timing and the ability to import workouts from your phone or computer. One of the best features of the 620 was how easy it was to use despite its considerable list of features, and thankfully, it looks like the Fenix 2 is attempting to steal that as well. The original Fenix was undeniably powerful, but it definitely faltered in terms of intuitiveness and UI/UX. The Fenix 2 has taken the 620's button layout (Light on the top left, Up/Down on the bottom left, Start/Stop on the top right, and Back on the bottom right), which we hope will make it easier to navigate than the original Fenix, which was very easy to screw up. We hope it also borrowed the 620's better laid-out menu system, but we don't yet have confirmation on that. There are plenty of other bells and whistles, too. For example, if you use the Garmin VIRB action camera you'll be able to use the Fenix 2 as a remote control. Or if you use an iPhone 4S or newer you'll be able to receive call, text, and email notifications right on the watch, so you can keep your phone protected in your backpack. No word yet on whether that functionality will make its way to Android. [UPDATE: Garmin just reached out to let us know that this is coming to Android "Late Summer 2014."] We'd love to see its Bluetooth capabilities expanded further so it could do things like play/pause and skip tracks for the music on your phone. Hear that, Garmin? In terms of the competitive landscape, the only thing out there that really comes close is the Suunto Ambit 2, which came out in the middle of last year. The Ambit has many of the same swim features (though the triathlon mode isn't quite ready for race day), and it has the advantage of more flexible software with over a thousand user-created apps you can install. That said, the Ambit 2 doesn't have Bluetooth and it starts at a whopping $500. The Fenix 2 starts at $400 (or $450 if you want it bundled with the HRM-Run heart rate strap). To put that in perspective, that's exactly how much the original Fenix, the 910XT, and the 660 cost. So it seems that the Fenix 2 combines the best of all of them, and charges the same price. Nice! Will there be trade-offs? Probably, but we can't see them on paper. It's worth mentioning that the original Fenix was absolutely plagued with bugs when it first launched, though most of those were subsequently fixed with firmware updates. Here's hoping Garmin learned from those mistakes. The Fenix 2 will be available to purchase in March 2014. If you're the type of person who runs, bikes, swims, hikes, backpacks and snowboards, and you don't want to have a different watch for each of those activities, this may be just the thing you've been waiting for. One watch to rule them all. Here's hoping.